Azerbaijan and Turkmenistan may lay the Siyazan-Turkmenbashi fiber-optic cable line through the Caspian Sea, Trend reports referring to the Azerbaijani Ministry of Transport, Communications and High Technologies on Jan. 10. This issue was discussed at a trilateral meeting in Baku between representatives of the corresponding ministries of Azerbaijan, Afghanistan and Turkmenistan. Among the representatives were Azerbaijani Minister of Transport, Communications and Information Technologies Ramin Guluzade, Afghan Minister of Communications and Information Technologies Shahzad Gul Aryobee, Afghan Finance Minister Mohammad Humayun Qayumi, Director General of Turkmenistan’s Ashgabat City Telephone Network Yusup Kerimov, Deputy Director General of Turkmentelecom Durdeli Ataev and Ambassador of Afghanistan to Azerbaijan Khairullah Spelenai. 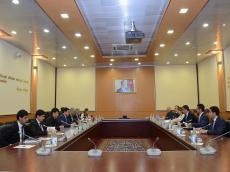 The meeting participants also discussed providing Afghanistan with internet through Turkmenistan. For this purpose, a decision was made to create a working group consisting of experts from the three countries.